When you’re heading into the woods for a couple nights out in your hammock, you’re going to want to make sure you’re equipped to stay warm. Proper insulation is crucial for a happy camping experience. Even in the summertime, it’s the real difference between waking up refreshed and waking up cold and tired. A proper hammock underquilt is the insulation of choice, but getting the perfect insulation will boil down to a few factors. Will you be primarily car camping or backpacking? What’s your budget? How cold do you expect it to be? 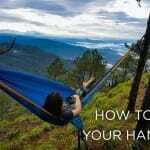 These are just a few of the considerations to make when choosing how to insulate your hammock. Insulation can be divided into top insulation and bottom insulation. Top insulation refers to something covering the top of your body when you’re lying down while bottom insulation is what’s insulating the bottom of your body. For most people that have gone tent camping, a sleeping bag is the top insulation and a sleeping pad is the bottom insulating layer. Even though a sleeping wraps around the entire body, it’s only considered top insulation. When you’re laying down the bottom of the bag compresses and loses the loft that keeps you warm. While your old sleeping bag and pad will work well in a hammock, many hammock campers prefer using a hammock underquilt and topquilt instead. These aren’t the quilts your great aunt may have in her guest room. Camping quilts are essentially sleeping bags that are fully unfurled. Like sleeping bags, they are made with a nylon or polyester shell and stuffed with down or synthetic fill. The hammock underquilt hangs on the outside of the hammock underneath you to provide an insulating layer for your bottom. The topquilt is used as a blanket in the hammock. Using quilts provides more freedom of movement in the hammock. It’s also easier to stay warm throughout the night since you don’t have to worry about moving off of the sleeping pad. A good quilt comes with a hefty price tag, but with proper care and maintenance, it can be a solid investment that lasts countless adventures. The argument for using a sleeping bag is that many people already own sleeping bags and would not need to buy another piece of equipment. Some people also prefer the cocoon-like nature that a mummy sleeping bag offers. If you opt for quilts as your choice of insulation there will be a few basics you need to know to pick the right one for you. Many small manufacturers exist that make excellent quality quilts, but because they are usually made to order, they can end up costing a decent chunk of change. So what do you need to know before making such an investment? The fill is the insulating material that traps warm air and keeps you warm. Fill can be either down or synthetic materials. Both of these materials offer their own pros and cons, and the choice will largely boil down to your personal needs. Down is very effective at keeping you warm and can be compressed to an astonishingly small size. While traditionally down is notoriously ineffective if it becomes wet, modern technology has created many water resistant materials to keep your down dry. However, if you live in a very humid climate, this is still an important factor to consider. Wet down is useless and could send you home early if any water seeps into the insulation. When using down, make sure you know how to use a hammock tarp to stay dry. The other major benefit of down is that it is incredibly lightweight and compressible. 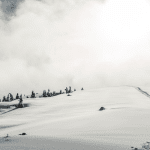 If ultralight backpacking is your goal, the lighter weight of down is a serious consideration. While newer synthetic materials are challenging down’s advantages, currently it’s still the king when it comes to weight and size. However the benefits of down come with a monetary cost. Compare two Enlightened Equipment underquilts: the down-insulated Revolt and the synthetic-insulated Prospect. A 20°F rated Revolt costs $235.00 for a regular length quilt while a similarly rated Prospect at the same length costs $170.00. Consider that you will need both a topquilt and underquilt for your hammock sleep system and the price difference can become significant. Underquilts come in half, three-quarters and full length. The right size for you will depend on a combination of your target pack weight, budget and how warm you sleep. A full length hammock underquilt will cover the entire length of the hammock and cover most people from the head to the toe. These are extremely warm and will keep you toasty even in winter (if they are sufficiently rated to winter temperatures). For many hammock campers, a three-quarters length hammock underquilt is sufficient and shaves off a significant amount of weight and bulk. While each person sleeps comfortably at different conditions, users that sleep cold often bring a small pad for their feet or wear extra thick socks to make up for the lost length. Half length underquilts are usually reserved for ultralight enthusiasts that are aiming to shave as much weight off their pack as possible. An underquilt and topquilt can be made relatively easily if you have the right materials and can represent a significant amount of money saved on buying new gear. Maybe you’re still a bit on the fence about hammock camping and not ready to invest in a quilt system. Or maybe you want a single piece of equipment that for tent camping and hammock camping. 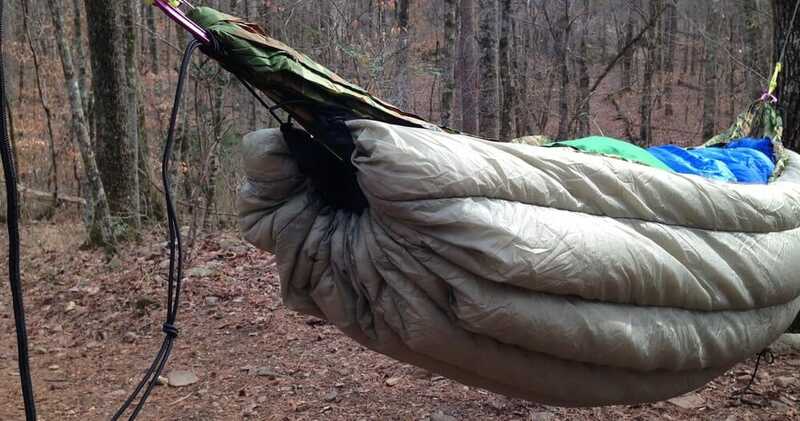 Luckily, your old sleeping bag will work well in a hammock. Using a sleeping bag in a hammock is pretty straightforward and essentially the same as using on in a tent. You position your sleeping pad and sleeping bag, get in and zip up. Because of the suspended nature of a hammock, it might take some squirming and adjustment to get yourself in the ideal position. With an underquilt, sleeping bags can be left unzipped and used as a large topquilt. The downside is the redundant bulk that the sleeping bag will add to your pack. However, this is a solution for people that are not interested in investing the money towards a topquilt just for hammock camping. A sleeping pad in a hammock can be uncomfortable to some when compared to a hammock underquilt, but it still offers a few advantages. A sleeping pad will be lighter and often smaller than an underquilt. A pad will also be more versatile than an underquilt if you are backpacking in an area that doesn’t have trees. While the underquilt is essentially useless unless it’s attached to a hammock, a pad will work in a hammock and on the ground. A third important advantage is cost. With foam pads as cheap as $20 and inflatable pads costing less than $80, the cost factor cannot be ignored. Adventurers looking to assemble a versatile set of gear without breaking the bank should keep this in mind. When using a pad in your hammock, staying on top of the sleeping pad the entire night is a big challenge. Extra wide sleeping pads are preferred. Some sleeping pads like the Klymit Inertia X are designed to go into your sleeping bag, eliminating the struggle of keeping your sleeping bag ontop of the pad. Big Agnes also makes a series of sleeping bags that feature a slot for attaching sleeping pads. 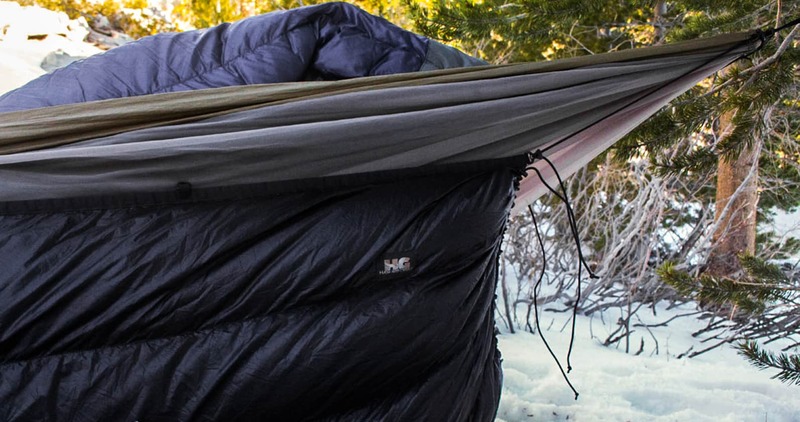 There are many ways to stay warm while winter hammock camping. The key to long term use for your insulation is proper care and storage. No matter what the fill, quilts or sleeping bags should be stored in a cool and dry location. It’s important not to use a compression sack for storage. Leaving it in a compressed state for too long will cause the insulating material to lose loft and be less effective. Instead, hang your quilt or sleeping bag in an uncompressed state. Additionally you can use a large storage sack to keep your insulation from staying compressed. It’s also important to routinely clean your equipment. Some quilts and sleeping bags can be machine washed, but if the manufacturer does not recommend it, wash it by hand. To hand wash, submerge the entire quilt or bag in a bathtub filled with warm water and a mild detergent. Gently massage the quilt or sleeping bag to expose all the insulating material to the soap. Afterwards, carefully remove the soaked equipment and gently press out the water. Air dry the quilt or bag and periodically go pull apart any clumping of the insulating material that may occur. Take care to dry it slowly and completely. Cleaning is a time consuming process, but proper hammock maintenance will give you years of use. Knowing how your body reacts when sleeping outdoors is crucial to picking a sleep system that is right for you. When you’re camping, use a combination of your sleep system, clothes, hats and socks to get the optimal level of comfort each night. 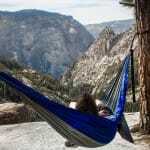 Check out these tips to stay warm while hammock camping! This entry was posted in Camping, Equipment, Materials and tagged Camping, instructional, insulation, tips, winter camping.